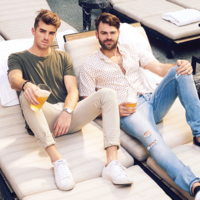 The Chainsmokers are an American, New York City-based, disc jockey/producer/songwriter duo consisting of members Andrew Taggart and Alex Pall. The duo rose to fame with their 2014 hit "#Selfie". Andrew Taggart was born in 1989 in Portland, Maine. Alex Pall was born in 1985 in New York City. Pall studied art at New York University, while Taggart studied at Syracuse University. In 2012, they came together as a DJ duo and are now residing in New York, NY. The Chainsmokers were formed as an EDM DJ duo in 2012 under the management of Adam Alpert in New York City. They grew a loyal fan base putting out remixes of indie bands. In 2012, they collaborated with Indian actress and recording artist Priyanka Chopra on the single "Erase," which was followed by "The Rookie" in early 2013. They released "#SELFIE" for free in December of 2013 which got picked up by Dim Mak Records who rereleased it in January of 2014. Weeks later, the duo signed a major label deal with Republic Records.